The Sony PMW-F3L is part of the CineAlta 24P family of digital cinematography products and its support for multiple frame rates includes a filmic 23.98P as well as S-Log workflows. The newest member of Sony's CineAlta lineup, the PMW-F3 inherits DNA from the F35, which has been used for years in high-end digital cinematography, as well as most of the features and file-based workflow capabilities of PMW-EX1R and EX3 XDCAM EX solid-state memory camcorders.The PMW-F3L is equipped with the newly developed Exmor™ Super 35 CMOS image sensor, PL lens mount, and SxS card for 1920 x 1080 full-HD recording.The PMW-F3L features future expandability, including RGB 4:4:4 baseband output with S-LOG gamma for external recording which means it can be used in an HDCAM-SR™ workflow. It also offers a 3D-LINK option, which allows two camcorders to be controlled simultaneously for 3D stereoscopic shooting. Please find preliminary information on Sony PMW-F3L features below. This information is subject to change. More information will be made available soon. The Sony PMW-F3L is equipped with a Super 35mm sensor which is the same size as Super 35mm film and has been specifically developed for digital cinematography. Its positioning within the chassis is exactly the same as it would be within a 35mm film camera – ensuring exactly the same optical performance with the unrivalled range of 35mm Cine lenses. The Sony PMW-F3L is supplied with a PL Mount Adapter to provide immediate compatibility with the huge range of filmic 35mm lenses, including prime, digital cinematography and even still lenses. There are also hot shoe electric interfaces for Cooke/i and ARRI LDS. Sony plans to introduce a range of zoom lenses directly compatible with the F3 mount. More details will be revealed shortly. Zoom lens compatibility expands the operational flexibility of the F3 so it can be used for almost any application. The Sony PMW-F3L camcorder is the first compact camcorder to be a member of the legendary Sony CineAlta™ family. It offers native 23.98P* recording which, in combination with advanced creative features such as selectable gamma curves, makes this camcorder ideal for cinema production. The Sony PMW-F3L offers a powerful 'Slow & Quick Motion' function - commonly known as over-cranking and under-cranking in film shooting. This enables users to create unique 'looks' or special effects with slow- and fast-motion images, and can be selected on the control dial on the side of the camcorder. The Sony PMW-F3 can capture images at frame rates selectable from 1 fps (frame per second) to 60 fps in 720P mode and from 1 fps to 30 fps in 1080P mode, in increments of 1 fps, onto a single card. For example, when viewed at 23.98P, images captured at 60 fps will appear 2.5 times slower than normal. Conversely, images captured at 4 fps will appear 6 times faster than normal. The Sony PMW-F3 camcorder records 1920 x 1080 HD images using the 'MPEG-2 Long GOP' codec, which conforms to the MPEG-2 MP@HL compression standard. 'MPEG-2 Long GOP' is a mature codec - also adopted by the XDCAM HD and HDV 1080i series of products - which enables users to record stunning quality HD footage with highly efficient, reliable data compression. The Sony PMW-F3 camcorder offers a choice of bit rates - either 35 Mb/s (HQ mode) or 25 Mb/s (SP mode) - depending on the desired picture quality and recording time. The HQ mode supports both 1920 x 1080 and 1280 x 720 resolutions. The SP mode supports 1440 x 1080 resolution at 25 Mb/s, which provides compatibility with HDV 1080i products. The PMW-F3L camcorder offers a wide array of recording formats for multiple content creation applications. Scanning mode is switchable between 1920 x 1080, 1280 x 720, and 1440 x 1080 resolutions. Frame rate is also selectable from interlace and progressive - 59.94i, 50i, 29.97P, 25P, and native 23.98P*. The Sony PMW-F3L camcorder offers a 'Slow Shutter function' for capturing clear images in low-light environments. This allows the shutter speed to be extended to a maximum of 8 frames. The 'Slow Shutter function' not only increases camera sensitivity but also produces a special blurring effect when shooting a moving object, for enhanced shooting creativity. The shutter speed is selectable from 2-, 3-, 4-, 5-, 6-, 7- and 8-frame periods. In addition to HD recording, high-quality audio is an equally significant feature in the XDCAM EX system. 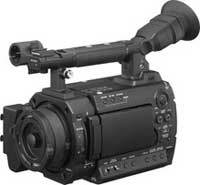 The PMW-F3L camcorder records and plays back high-quality, two-channel 16-bit, 48-kHz linear PCM uncompressed audio. The Sony PMW-F3L uses XDCAM EX’s proven high-speed, intuitive workflow and offers seamless integration with leading nonlinear editing software. In addition, 10bit 4:2:2 HD-SDI output opens up hybrid recording possibilities with content simultaneously recorded on internal memory and, in uncompressed form, on a variety of external recording devices. From April 2011, a Dual Link HD-SDI option will enable 10bit RGB 23.98/25/29.97PsF or 10 bit 4:2:2 108050P/59.94P uncompressed external recording – ideal for integration with highest quality production workflows such as HDCAM SR. The PMW-F3L also supports selectable Gamma, four levels of HyperGamma and S-Log for a wide range of shooting conditions from standard to wide latitude. The PMW-F3L can simultaneously record LUT (Look Up Table) information onto the internal media for additional workflow flexibility. In addition, PMW F3 with an optional MEAD-MS01 or MEAD-SD01 Media Adaptor***, a high-speed Memory Stick™ or SD memory card**** can be used as emergency or alternative recording media. Utilising a mature and highly efficient compression format together with high performance SxS memory cards, the Sony PMW-F3L can record superb quality HD images for an exceptional 140 minutes* on a single 32Gb update SxS card. As the PMW-F3L features two memory card slots, this recording time is easily doubled to 280 minutes (with two 32Gb cards) and when recording across two cards, the transition is seamless without any frame loss. The Sony PMW-F3L is part of Sony’s highly successful XDCAM EX product family which supports a high speed nonlinear workflow. With XDCAM EX, recordings are made as data files in the 'MP4' format, which is widely used in a number of recent electronic portable devices and has been standardised by ISO. File-based recording allows material to be handled with great flexibility in an IT-based environment - easily available for copying, transferring, sharing, and archiving. All these operations are accomplished without any 'digitizing' process required. File-based data copying allows for degradation-free dubbing of footage, which can be performed easily on a PC. The file-based recording system also allows for material to be viewed directly on a PC - simply by inserting the SxS memory card into the Express Card slot on a PC or Mac, or by linking a PC/Mac to the XDCAM EX unit via a USB2 connection. This works in just the same way as a PC reading files on an external drive. The file-based operation can dramatically improve the efficiency and quality of your workflow.